The idea behind IndieBox is very simple: let people pay a little extra to get a fancy give physical copy of an indie PC game. Why? Because getting a game in a box, with a colour manual and a poster, is a really nice touch, that's why. 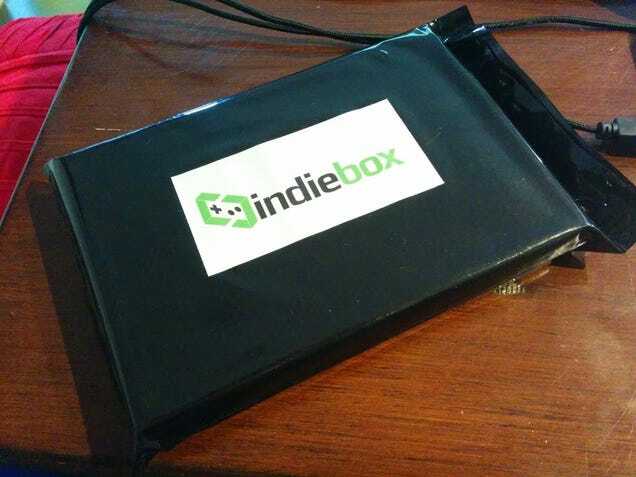 Sure, it's easy to get an indie game on Steam, or in a Humble Bundle, or however, but that's not the point of IndieBox. The point of IndieBox is that you don't just get a game, you get to partake in the physical experience of getting a fancy new PC game, a pleasure that's been dead for well over a decade now. By fancy I don't mean a DVD case and a slip of paper. I mean a proper PC gaming box, like we used to get, in the good old days. 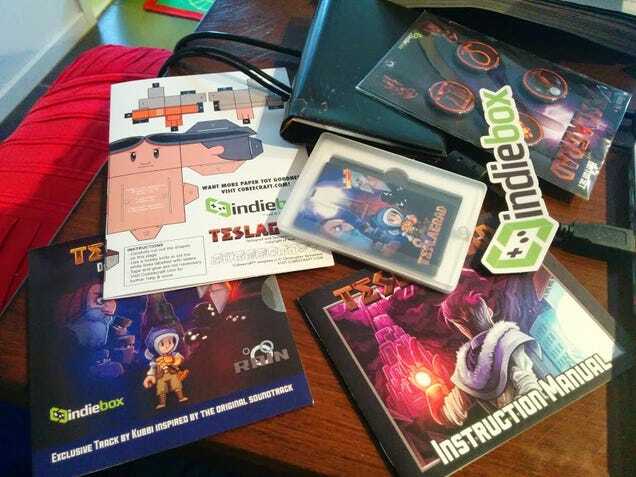 IndieBox is acting as a physical publisher for a range of indie games, and their first title is Teslagrad, a Steampunk platformer that was first released last year. My copy showed up yesterday, and it was so cool I thought I'd take some shots and show you what's inside. 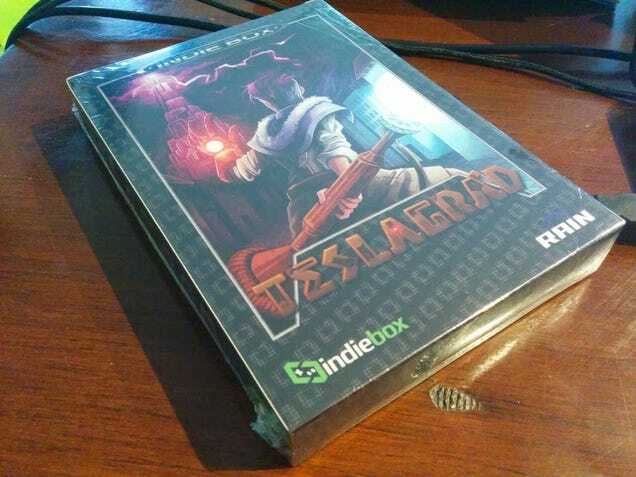 Note that I only know it's Teslagrad because I opened it. Future purchases are blind orders, concealed by the black packaging. More on that later. As you can see, yes, it's a box. Digging the Genesis styling. Inside is not just the game, but a whole bunch of stuff, including badges, stickers, a poster, a papercraft model, soundtrack and a full colour manual. If you're wondering where the game is, it's the credit card-looking thing in the middle. 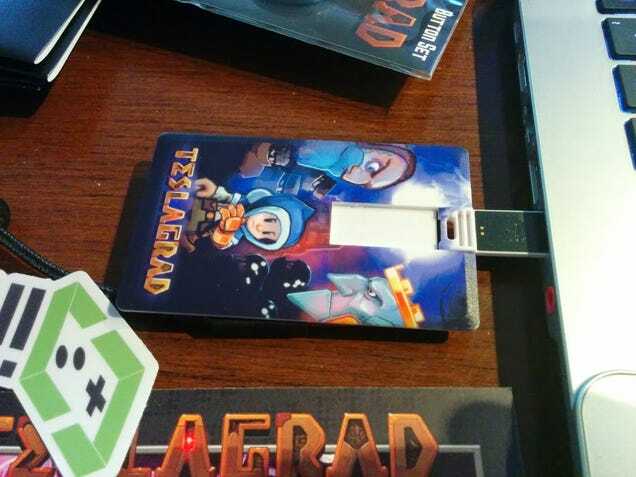 That's actually a thin USB stick, which while looking precarious does indeed function and contain a copy of the game. It's a very cool way to get hold of some very good video games. I mean, the games themselves are great, but to get all this other stuff with them as well helps dial back the clock a little and make you consider them to be something you own, rather than a digital plaything that you borrow, consume then forget. That is, if it's something you actually want to own. IndieBox's sales pitch is an unusual one; rather than offering these boxes for sale, they're asking you to subscribe to their service. Pay $15 (£9) a month, for example, and every month for 6 months you'll get a game delivered to your door. You just won't know what that game is. They're promising some big guns, so it's not like you'd be getting some random piece of busted junk turn up at your house, but then not every game is for everyone. So if you're picky, this might not be for you. Then again, the key market for this stuff probably wants all the indie game boxes, so won't mind what the actual title is. And it might be a very smart for IndieBox to cover the manufacturing costs of all this stuff while still offering an affordable service. Those after specific games that IndieBox are offering will be able to get them as "back issues", with games available individually after they've been sent out, but those will be available in strictly limited quantities; Teslagrad, for example, has already sold out. It might not be for everyone, then, but for a certain indie gaming aficionado - or someone nostalgic for the days PC games were a luxury purchase - this might be the most surprisingly effective way of spending money on video games you've ever seen. You can check out more at IndieBox.